Goals are a great thing to make for yourself. I know it sounds corny, but it actually really works. If you put your intentions out there and really believe in them, they can actually come true. 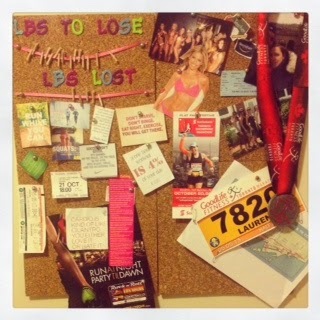 I know this because I made this inspiration board a year and a half ago and it helped me to achieve my dream of running a half marathon. Everyone has different goals, therefore everyone's inspirational board should look different to reflect what is important to them. Below are some ideas you might find are inspirational to you as well! accomplished and what I am capable of. training, but I keep these up there for the future! keeping in contact with my friends even when life gets crazy busy. 5. A picture of my fiancé. This picture motivates me to keep focused on my future. 6. A career picture - One day I'll get that permanent contract!!! keep track of my weight by hanging up clothes pins every time I lose a pound. Remember to keep focused on what is important to you and what you want for yourself in the future!